We're out of town but I wanted to be sure to post a few of the books we've been reading this week. I hope you're having a great weekend! I picked up a couple new books by Syd Hoff for C. He's read Danny and the Dinosaur and Sammy the Seal already. This week we picked up The Lighthouse Children and The Horse in Harry's Room . He hasn't read The Horse in Harry's Room yet, but he did read The Lighthouse Children, and he did great with it. This is the story of a couple who lives at a lighthouse. They don't have any children, but the sea gulls visit often and they've named them and treat them like children. When they move after a storm, they miss their sea gull children, but they find a way to see them again. It's a sweet story and a great level for C to read now. He needed help on most pages the first time, but after a second reading, he's now able to read it independently. The other book I'll mention is a picture book called Crazy Hair Day by Barney Saltzberg. This is a cute story about a boy who gets all ready for Crazy Hair day at school, only to find that today is picture day ~ Crazy Hair day is next week! So Stanley hides in the restroom for most of the day trying to avoid the embarrassment of having crazy hair on picture day. His friend tries to help and eventually convinces him to join in the picture, where Stanley gets a big surprise. That's it for this week since I am not home so I can't go through the rest of the books we have! What have you been reading with your children this week? Join the blog hop! Crazy Hair Day looks fun! And I hadn't heard of that Sid Hoffe book before. We like Sammy the Seal, and Danny and the Dinosaur - we'll have to check out the other two, as well. Thanks for joining! We have Danny and the Dinosaur, but we didn't read any other books by Syd Hoff. 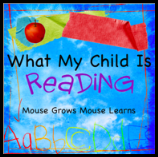 We're now working through Lobel books - Anna loves Mouse Tales.